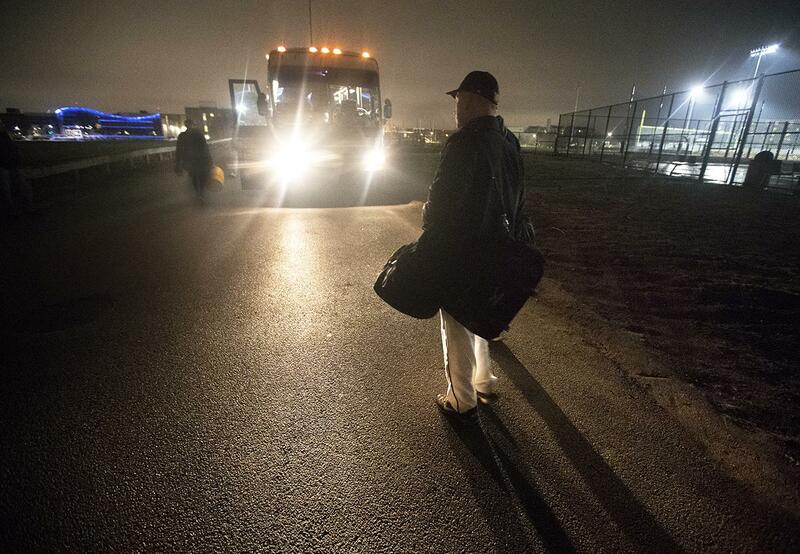 Wentworth coach Steve Studleyheads for the bus after a “home” game at UMass-Boston. 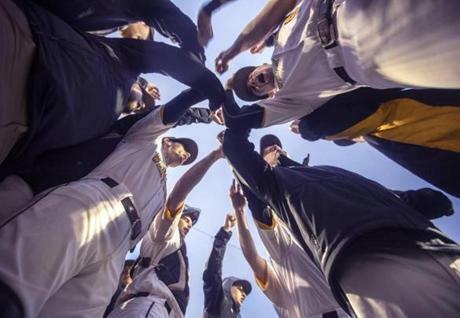 With no diamond on campus, the Wentworth baseball team has to improvise and persevere — but the players do it all without complaint. They call themselves baseball nomads. The Wentworth Institute of Technology Leopards are homeless. They have to travel to every game. There is a state-of-the-art playing field on the Boston campus, but Sweeney Field is for the softball, soccer, and lacrosse teams. At home, the baseball team doesn’t even have its own locker room. In an age when college athletes are increasingly pampered, these Leopards are extremely adaptable, just like their namesakes. “It definitely affects us, but our coach always says, ‘Don’t make excuses, make adjustments,” so that’s the motto we live by every day,” said Robby Sheldon, a pitcher and senior captain. Head coach Steve Studley, who has amassed 224 wins in 14 seasons, has instilled an attitude of gratitude. 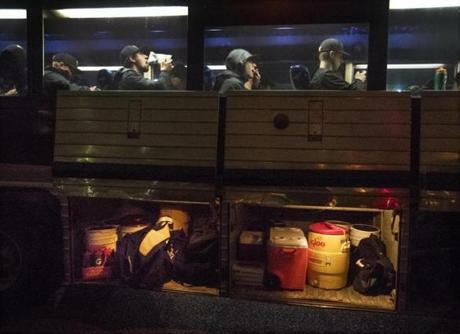 For this resilient team, the baseball season can seem like one long bus ride. For practice, the players hit the wooden floors of Tansey Gymnasium or cram into Sweeney Field. But things are getting better. They play most of their designated “home” games in Brockton, 25 miles away. They also play two home games at UMass-Boston. In the past, the players have arisen at 6 a.m. to travel to Springfield to be the home team, while their opponents were sleeping in. 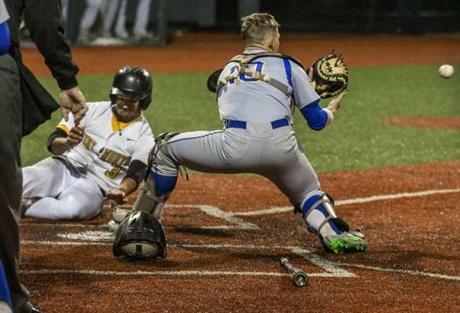 Anthony de la Cruz, wearing his home whites, slides in safely in a game at UMass-Boston. But this joyful band of engineering and architectural students has designed a blueprint of hardball happiness. They simply don’t whine. No problem, they say, even when very few fans travel to their games. Nor do they complain about sharing their locker room with the volleyball and basketball teams. Some of the freshmen have to share lockers. 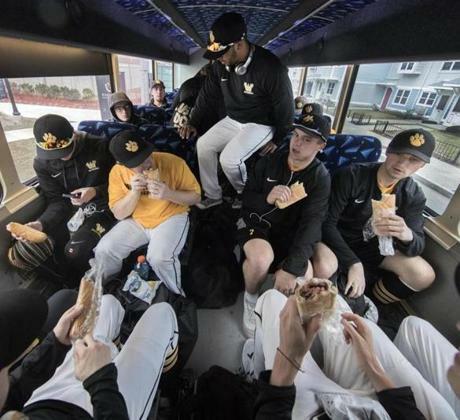 Dining in close quarters on bus rides is not a problem for this tight-knit team. The Wentworth athletic director loves their spirit. This year, Aaron secured Campanelli Field in Brockton and Monan Park at UMass-Boston for “home” games. That was a move in the right direction, said Studley, who recalls the program’s glory days when they played home games at Northeastern’s Parsons Field, a mile away in Brookline. From 2008-11, the Leopards won 105 games, more than any other baseball program in Greater Boston. This year, they lost their first four games, but finished 13-16 after defeating Curry, 4-1, Tuesday. In the offseason, the players ran their own workouts at Clemente Field in the Fens. Red Sox historian Gordon Edes was so impressed with their grit and passion that he adopted them as his second-favorite team. He invited them to Fenway Park to watch batting practice before a game against the Yankees. At Sweeney Field, players lug batting screens, an Iron Mike pitching machine, and other equipment two blocks down Parker Avenue from Tansey Gym. But they refuse to complain. Toting some equipment across Ruggles Street is outfielder Tommy Madigan. Softball coach Alex Campione feels bad for the guys. Meanwhile there’s construction digging up the campus. They’ve found all sorts of stuff, including a 100-year-old New Hampshire license plate and a 200-year-old intact jar of pickles. But they haven’t found room for a baseball field. There’s incredible baseball history just down Huntington Avenue at Northeastern. The first World Series game was held at the old Huntington Grounds in 1903, with the Boston Americans defeating the Pittsburgh Pirates. That’s little solace to the Leopards, who can’t use the Wentworth softball diamond because the dimensions are only 200 feet to the foul poles. They use the rectangular soccer field to take batting practice. Studley tells them to hit the ball toward center field so baseballs don’t fly into the street. There are penalties if that happens: The player has to drop his bat and race to retrieve the ball. 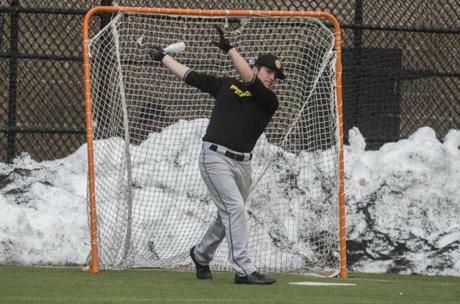 Infielder Jack Ruprecht takes batting practice, with a lacrosse goal as a backstop and snow banks as a backdrop. 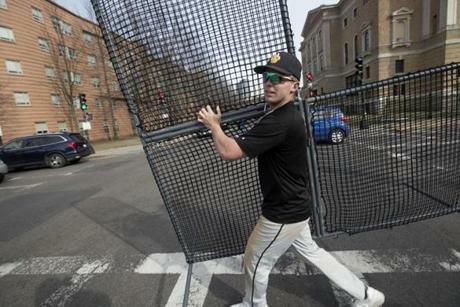 Twice a player had to scoop a ball off the Green Line tracks on Huntington Avenue. Anthony de la Cruz also launched a 320-foot bomb to dead center that exploded the back window of an SUV in the parking lot. On game day against Johnson & Wales in March, the starting time had to be changed because BC High was using the field at Monan Park. Then the game was nearly canceled because of an insurance snafu. The bus driver had trouble finding Monan Park, and the Wentworth team got an extended view circling the JFK Library. Talk about profiles in courage. When the Leopards finally arrived, they changed into their dress whites outside the ballpark fence, in front of a construction site. During the game, they never quit. They banged out 15 hits in a 9-8 loss. Just as in batting practice, most of the hits were up the middle. Studley takes it all in stride. Lack of a home field does nothing to dampen team spirit.